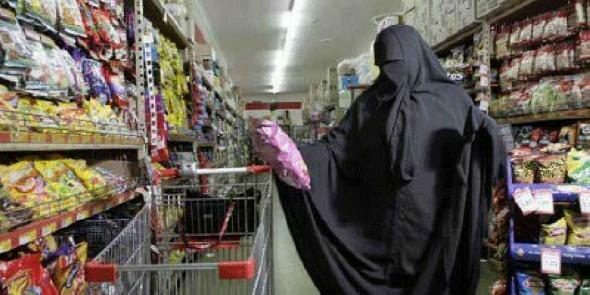 Iraqi woman in a U.S. grocery store is told off by another patron after disdaining America's bombing of her country. Claim: Iraqi woman in a U.S. grocery store is told off by another patron after disdaining America’s bombing of her country. One of my dear sons serves in the military. I’m a very proud Mom. He is still stateside here in California. He called me yesterday to let me know how warm and welcoming people were to him and his troops everywhere he goes. Telling me how people shake their hands, and thank them for being willing to serve and fight, for not only our own freedoms, but so that others may have them also. The woman in the burkha then asked the cashier when she was going to stop bombing her countrymen, explaining that she was an Iraqi. I am, like at least some that were in the store, outraged! But it also warmed my heart to know that we as Americans are speaking out, calmly and succinctly (finally) to those that enjoy the freedoms here in the US. Hooray for Ann Rea’s son, hooray for that checker, hooray for the gentleman in the store for his actions, hooray for Ann Rea for sharing this with all of us. Origins: We first encountered this item in April 2003, during the early days of the war in Iraq, and since then it has been passed from inbox to inbox variously titled “Ann Rea’s Son,” Rea’s Son,” and “Letter from a Mom.” It has also been circulated in variants that change the nationalities of those involved from American to Canadian, British, and Australian. and neither his base nor his unit was mentioned. Likewise, none of the other characters in the story had a name or was in any other way identifiable: not the patriotic cashier, the burqa-clad woman, or the outspoken older man. Indeed, neither the name of the store nor the city where the incident purportedly took place was provided. When confirming evidence is lacking, one should strive to remain skeptical of what are presented as real-life accounts that state in narrative form things people are predisposed to believe, especially those tales wherein wrongdoers get their comeuppance through being told off by others. The “ungrateful Iraqi read the riot act over her lack of appreciation for the sacrifices Americans are making for her” is too neat an illustration of a concept held too dearly by too many not to be viewed with a dose of suspicion.